From the moment that I learned what a midwife was (amidst a graduate program in something mostly unrelated), I was completely hooked - something inside me just clicked and I knew that midwifery was what I was meant to do. I was SO LUCKY and I started a midwifery apprenticeship with Maryn Green two months later in January 2011 (many students take years to get an apprenticeship opportunity). Maryn was my primary mentor for five years, during which time I also worked directly with 5 other midwives (many more if you count all the amazing mentors and teachers!). Over the last 7+ years I have attended home, birth center and hospital births and have taught hundreds of hours of childbirth education. Read more about my education below. When I am not doing local birth work and seeing Duluth Midwife clients, I stay busy writing, creating content and communicating with pregnant parents for the Indie Birth Association which I co-run with Maryn, my midwifery mentor. You can find me teaching new midwifery students through the Indie Birth Midwifery School, planning our annual Indie Birth Conference and plotting to take over the birth world one workshop at a time. But best of all, I was blessed with a daughter in 2014. She was (against all odds) born at home in Oak Creek Canyon on a hot July afternoon and she is the best thing that has ever happened to me. She took my education and passion about birth and mothering to a whole new level that I am so excited to share with my community. I believe that changing the way we do pregnancy and birth has the potential to truly change the world! When pregnant people have more knowledge about the birth process, they can make clearer and more intentional choices. They can be empowered in their pregnancy and birth experiences and start parenting journey with a sense of confidence. It is my job as a midwife to hold the space for women as they navigate their own pregnancies, serving them as a guide and a support when called on. I believe that based on the best available evidence, home should be the default choice of birth location for most people. I also respect and understand that there are times and reasons that families choose to birth in the hospital. In any case, I believe, and the science shows, that the more undisturbed a labor is, the safer it is. Therefore we should question all interventions, practices and birth traditions. Our baseline should be unhindered, normal birth. I am here to support you as you navigate these choices - whether you take a class with me, attend one of our Midwifery for the People clinics, or ask that I walk with you through the whole of your pregnancy, birth and postpartum experiences. I graduated with a Bachelor's degree in Sociology and Women's and Gender Studies from Northern Arizona University in 2010 and shortly after, realized that I wanted to become a midwife. I soon met with my future preceptor, Maryn Green, and started my traditional home birth apprenticeship in January 2011. She was my primary midwifery mentor for five years, during which time I also worked with 5 other midwives (many more if you count all the amazing mentors and teachers!). In February and March 2016, I apprenticed as a primary midwife at Better Birth, a high volume birth center in Utah. Over the course of 5 1/2 years I did intensive self study and guided study with my preceptor and also completed coursework with Ancient Art Midwifery Institute. I am certified in Neonatal Resuscitation, and currently teach student midwives through the Indie Birth Midwifery School which keeps me always learning and growing as a midwife. I officially opened my own home birth practice at the end of 2016 and have had a steady and growing stream of clients ever since. Alisha is a midwifery apprentice with Margo in the Duluth community & surrounding areas. She believes in the value of a traditional, community model of training and thrives with the “hands on” education. 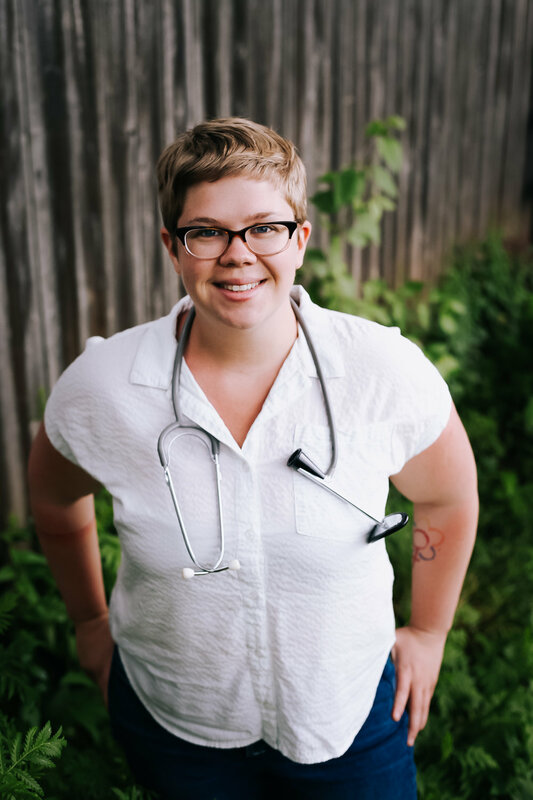 While also attending Indie Birth Midwifery School, she is also learning via birth conferences, workshops, and community events. She is so excited to share her passion for the art of midwifery care and thanks everyone for the opportunity to do so. Alisha’s first birth experience in a small, rural hospital was drastically different than the inspiring and empowering natural birth of her second in a birth center. The midwifery care she received during her second pregnancy and postpartum inspired her to take part in educating women on how important an undisturbed birth can be directly related to mom and baby’s health and well-being. Alisha is passionate about serving the community and strives to educate on wise woman care during pregnancy, birth, and the postpartum. Alisha’s other passions include caring for her two little girls at home, teaching piano, drinking coffee, cooking, and enjoying the great outdoors.